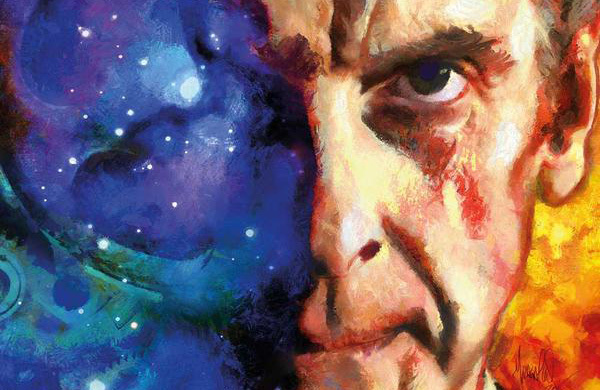 Doctor Who: THE TWELFTH DOCTOR #2.8 Review @comicstitan | Warped Factor - Words in the Key of Geek. There are comic-books that are just comic-books. Then there are comic-books that act as comfort blankets. You know what I’m talking about. In a world where every TV blares the offensive spittle-flecked rhetoric of the dangerous and the thinking-impoverished at you, you sometimes need a comfort blanket, don’t you? You sometimes need to believe that the human race is not all like that. That we’re not all doomed to follow the blowhards and the imbeciles as they drive us off the cliff of consensus and common decency into a pit of our own stupidity and their aggrandisement. No, don’t give me that, it’s not too strong, it’s the very reason for geekdom. Escape. Hope. Heroes, and the idea that maybe, just maybe, in spite of all the evidence, we silly little human beings might even be strong enough to be heroes ourselves. To make brave choices, not just easy ones. To have compassion in a busy world. To accept that maybe, just maybe, there are more important things than our own purely self-revolving lives and comforts. We are geeks and we badly want to believe in the good of human beings. 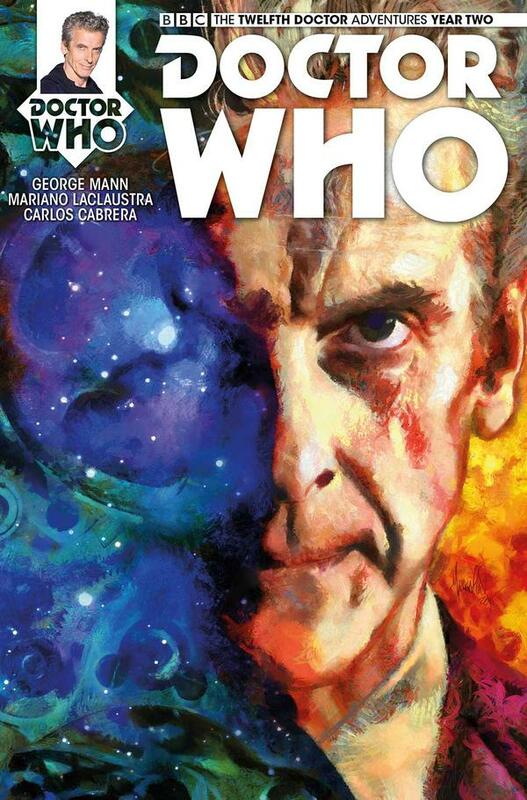 The Twelfth Doctor #2.8 taps into that need of ours, writer George Mann having established a science fiction scenario in which there are Us and there are Them, our histories intertwined in a way we might not be big enough to understand or accept, and a body in the middle. Who killed whom? Is a single death a mark of savagery on the part of a whole people? Can we accept truths that challenge our understanding of our world and our place in it? Would we, when faced with the reality of alien life, be able to embrace different cultures, or have we really not evolved from the days of drowning witches and grabbing our torch and pitchfork to run the stranger out of town? I hate that this is the case, but it’s a question we face today, in the here and now – in the age of Farage and Trump, our ability to co-exist with people different to ourselves is actually up for grabs in the sphere of our politics. In the age of pathetic debates about which bathroom trans people use, we have no grounds for smugness. Mann’s story has refused to play with grey areas – on his futuristic space colony, the Twist, the human settlers feel threatened by rumours of ‘monsters’ lurking among them, in the shadows, making plans to attack them indiscriminately. Meanwhile, the Foxkin – the so-called ‘monsters’ – have a history, a science, a culture of their own, and a long time ago, they were better than monsters. They had a choice between self-interest and compassion, and they chose compassion. Now we face the same choice – compassion or selfishness. Will we be monsters or, as the Doctor asks in this issue, will be we better than that? Will we be humans? The story is brought to its conclusion in this issue with a skill that you can believe the Twelfth Doctor would exercise. A murderer is uncovered, their reasons revealed, and with them, a stream of racist invective that, we’re led to believe, might be all too common in the people of the Twist, be they human or Foxkin. The way the Doctor rallies the people who don’t think like that, who might accept the truth and not jump to conclusions, is typical Capaldi-Doctor, and a thing of beauty. In a sense, it’s as traditional a dose of Doctoring as you could imagine – never give him a stage and a microphone and let him talk. But Mann takes the time to give the Twelfth Doctor the cleverness to find a way to defeat fear. To defeat rhetoric. To defeat finger-pointing and dark mutters. A way to bring out the human in all of the Twist’s inhabitants – and the Foxkin too. The writing from Mann then, which started this storyline presenting an intriguing sci-fi surface and a fairly standard monster-cliffhanger, and became an evolution of The Ark In Space in issue #2, concludes in this issue as an object lesson in draining the power of racist invective and replacing it with acceptance of all kinds of people for the general benefit of society. Go to the top of the class, Mr Mann. Where, as is very often the case, you’ll find Mariano Laclaustra, ready and waiting to give your vision a clarity and realism that helps deliver the message (and the actually storytelling). It becomes tiresome to read glowing review after glowing review, but Mann and Laclaustra really are a dream team – Mann always ready with an interesting idea, Laclaustra apparently determined that no such thing as a boring panel will ever go into one of his comics. Laclaustra, aided here by Fer Centurion and Agus Calcagno, and joined on colourwork by Carlos Cabrera and Juan Manuel Tumburus, is a talent that consistently makes you want more – his style, like that of several other high-class Titan artists, adds enormously to any project to which he’s assigned, the crispness, the vision, the richness of the visual environments he creates and the rightness of his Doctors and his other characters means you can buy a Laclaustra comic-book any day of any week and breathe out, sure in the knowledge that your eyeballs are going to a spa, and that the realism of the work will actively improve your buy-in to the story. When you have a story like this from Mann, that extra buy-in helps bridge the gap between the fantasy reality and our here and now reality and make the moral of the story stand proud. So get The Twelfth Doctor #2.8 because there’s actually no bad – the story from Mann is both shiny Doctor Who storytelling and, taking advantage of a Series 9 strand of character development, takes the opportunity to give us that comfort blanket that we need, and that the Doctor has often delivered in different ways – the hope of a different level of compassion and intellect from which to learn, and from which to take our example. The visuals are just inherently ‘right’ – whether architecturally or individually - and there’s a sharpness to the world that’s rendered that helps that message of compassion defeating fear and loathing come alive and make you want to join a protest, write a letter, vote for love, donate, change the world for the better, any way you can. Also, the Doctor swans off with a great new companion, who’s not enormously active in this issue, but without whom the resolution absolutely wouldn’t work. There’s less of a know-it-all vibe to this one than there eventually came to be about Clara, because of course they’re at the start of their journey with the Doctor, but they represent an exciting new take on the kind of people who can be the companion to this Doctor that might just possibly pave the way for the time of Bill when it comes on the TV version of Doctor Who. Get #2.8. Get it now. Both your eyeballs and your intellect will thank you. Things don’t have to be as bad as they look. The difference is people who are determined not to be the monsters.